In 1987, operating under the name "Lion Fire & Safety Supplies", the company started off with only a few service vehicles and basic fire extinguisher servicing equipment. The company slowly grew; expanding its customer base and perfecting the techniques required for servicing portable extinguishers and kitchen fire extinguishing systems. When Pyrene Fire Security (formerly Chubb Fire Security) tendered a couple of their branches for sale across Canada, the opportunity to get into the fire alarm market was too irresistible to pass up. After acquiring the Manitoba facility, the Pyrene product distribution rights, and the rights to the Pyrene name in Manitoba, the company dropped the old name in favour of the current. Early 90's, Pyrene Fire Security Manitoba become the warranty depot for several different brands of emergency lighting manufacturers. Provision of factory-supported service and original equipment manufacturer (OEM) parts allow us to offer our clients more for their dollar. Mid 90's, we added another service to our repetoire: kitchen exhaust cleaning. Restaurants no longer had to close twice for fire equipment service. Pyrene Fire Security Manitoba is proud to be the only Manitoba fire equipment service provider offering this benefit. The late 90's ushered in another period of growth as Pyrene Fire Security Manitoba opened a sprinkler division. This added services for sprinklers, standpipes, fire pumps, fire hydrants and cross connnection controls (backflow prevention) and enabled Pyrene Fire Security Manitoba to become the first all-inclusive fire equipment service provider in the Manitoba marketplace. Since our inception, we have led the industry with improvements in methods and code compliance. 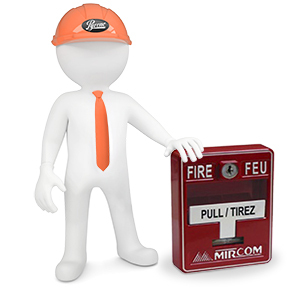 Truly a premier class service company, Pyrene Fire Security Manitoba is proud of its experience, its resources and its ability to anticipate, meet, and surpass the needs of its customers. We are a Manitoba, owner-operated company committed to providing reliable and expedient service to our customers at an affordable rate. The safety of occupants and property, and the associated liability of our clients is our utmost concern. That is why we take pride in our attention to detail, which enables our customers to attain 100% code compliancy.